DawgNation's Radi Nabulsi was kind enough to sit down and help us wrap up National Signing Day. The Q&A is a mix of looking back at the 2013 recruiting process and a look forward for things to come. You can find more of Radi's stuff here (not to mention Ching and Kipp's) as well as on Twitter. 1. First all, thanks for taking the time Radi. Nowadays we know recruiting coverage is a year round business. One thing I'm always curious about with you all is how you keep all the names and information straight. It's not just all the names, but also where they're from, their position(s), the schools they're interested in, where they've visited. How do you keep all that straight? I rarely do. Kipp Adams is the one with the encyclopedic knowledge of the prospects for a given year. As for me the only ones I can remember without having to look them up in our Recruiting Nation database are the guys with whom I have spoken. Once you drive to a recruits high school or interview him at a camp, well, there are just so many more points of reference from which to recall their particulars. I remember going to East Hall High School only to find out that Sterling Bailey had gone home early. That sort of thing makes it easier to remember what high school he attended. 2. And recruiting isn't the only thing you cover for DawgNation. You get to know the current players pretty well, especially during the season. Do you like that balance? What are some of the advantages/disadvantages if any? I do like the balance. It was something that I implemented at my previous stop. By covering the players as recruits I already have a good relationship with them when they arrive at Georgia. I am there for their first start and their final game. Knowing their background allows me to ask better questions and hopefully get better answers since they are more prone to trust me after having known me for years. The disadvantage is that I don’t spend as much time covering the team beat like David Ching does or the recruiting beat like Kipp Adams does. So I am not the expert on either side like they are. But I prefer to straddle the fence as it were. 3. Okay, so this year's class. I saw you asking on Twitter last week for everyone's grade for Georgia. What was the majority ruling and do you agree? A- and I agree with that. 4. Georgia is coming off a season when they had less than 70 scholarship players. I can see one side that is happy the coaches went aggressively after some big targets, but also the other side that is unhappy we didn't fill every spot. Do you think we needed to sign a few more than we did? Georgia addressed almost every area of need. The Bulldogs only signed one player for the secondary in 2012 and did not sign an inside linebacker. This year they signed five inside linebackers, five safeties and three cornerbacks. They added three defensive linemen, three offensive linemen and a top flight quarterback. Blake Tibbs was the only receiver in the Class of 2012; Georgia signed six in 2013. They did miss on some top talents, but 32 players, 13 of which enrolled early and 14 of which are in the ESPN 300, is nothing to sneeze at. 5. The downside I've pointed to is that we get so involved in the hype of the NSD guys, we forget about the ones that have been fully committed to Georgia, some for quite some time. For instance, I heard Coach Bobo say that Brice Ramsey was committed to him and Coach Richt before he was even committed to UGA. Of the signees, give us one name that you think will surprise us early on and another that will be a pleasant surprise for years to come, even if it is the same name. Johnny O’Neal is called the silent assassin by his coach and once he learns the scheme at Georgia he should be fun to watch. Also I think offensive guard Brandon Kublanow might just be the nastiest lineman the state has produced since I started following recruiting. 6. There was a lot of buzz late in the day on signing day about a late signee. Any updates along that front? Toby Johnson had contacted the coaches about dropping his final official visits and signing with Georgia. But he changed his mind apparently. Georgia had moved on from him earlier in January after it became apparent he was going to have trouble qualifying but after missing on some top targets, Georgia had room to take a chance. I do not think Georgia is actively recruiting him now. 7. In your view, how much did Garner leaving hurt us with this class in the end? It cost Georgia the services of Montravius Adams but allowed the Bulldogs to flip Davin Bellamy away from FSU. Time will tell how that plays out for the Bulldogs. 8. Similarly, in your estimation how much did the Grantham rumors work against the coaches? I think that hurt but it is tough to point to a recruit and say, ‘Wow, Grantham caused Georgia to miss on that guy.’ There are rumors about Kirby Smart and Dan Quinn every year. So I say get used to it because if you have a top coordinator (which the best programs do) then there will always be rumors circulating about their future. Heck those are sometimes started by other coordinators but that is a different topic. 9. One of the things that we took away from the SECCG was that Alabama's depth and talent along the offensive and defensive line was much better. Given that and missing out on guys like Laremy Tunsil and Montavius Adams on signing day, do you think the coaches are kicking themselves over missing out earlier in the process on guys like JP Vonashek and Kelsey Griffin? Not really. Tunsil had apparently silently committed months prior to his dramatic flip and before Garner left the I think Georgia liked their chances with Adams. Taking those guys would have made Adams and Tunsil the fifth linemen taken on their side of the ball. That could have killed Georgia’s chances to land either. Once they had their three guys on each side, why not hold out for the top target? 10. 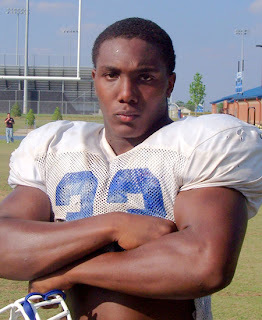 And lastly, give us a name or two Dawg fans should know about for the 2014 class? 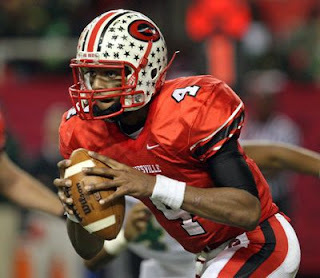 Deshaun Watson, the record-setting quarterback out of Gainesville High School who is committed to Clemson and Sony Michel, the talented running back out of Miami. Keep an eye on both. Thanks again to Radi for stopping by. If you're on Twitter you're missing out if you're not following him. Because there's a lot more where this came from. Monday's Meatloaf - Et tu, Herschel?